I made these iPod cozies for an "iTunes" themed raffle basket for my son's class. I made the one on the right first, and realized it didn't have a complete monkey on it. So I made the one on the left and sent it in. They are both lined in light blue interlock knit fabric. I guess it is supposed to be a little iPod sleeping bag to keep your iPod nano from getting scratched up (or scratching other things) in your bag. It wouldn't be something you would keep on the nano while in use, though. I wanted to mention that I met knitting designer Nicky Epstein on my cruise. In the ironing room, of course (no ironing allowed in staterooms, too much risk of fire). I was up there ironing my skirt and Lauren's dress for formal night, and a couple of women came in to press some little knitted hearts and we chatted for a minute. The friend who was with Nicky told me they were on a knitting cruise, most of their group was from Houston, and that Nicky is a famous knitwear designer who has written 19 books or so. I saw them again while shopping in Cozumel and have to say that Nicky didn't remember me until I said, "remember, we met in the ironing room?" Check out her books--the knitted and crocheted flower books look very interesting. 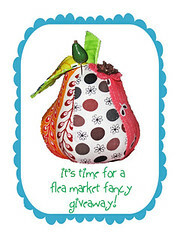 Finally, have you heard about this great flea market fancy giveaway? Lots of Flea Market Fancy fabric and some books are up for grabs! a brush with fame! exciting :) your cozies are cute, perfect for kids too! Very cute cozies! Best wishes in the contest! Cute! Your cozies are darling!